Filipino boxing champ Manny Pacquiao lost to American boxer Timothy Bradley in their match at the MGM Grand Garden Arena in Las Vegas on Saturday, June 9, 2012. Bradley is now the new WBO welterweight champion of the world. The two boxers gave spectators at the venue and the millions watching around the world a terrific fight, with Bradley having his moment in the first three rounds. 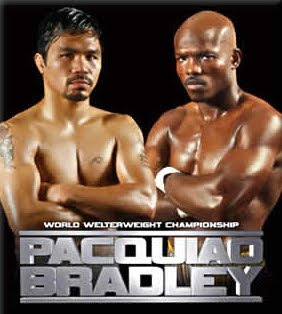 In the fourth round forward, it was Pacquiao’s experience and strategy that came over Bradley’s aggressiveness and hunger to win. However, two judges saw it the other way and scored the bout 115-113 in Bradley’s favor, giving him the victory via a split decision. Bradley remains undefeated as a professional boxer. Sunday’s match was the biggest upset of the year in as far as the sport is concerned. It ended Pacquiao’s 7-year streak without losing a fight in the ring. With the win, Pacquiao’s record slid to 54 wins (38 wins by KO), 4 losses, 2 draws and 0 no contests in 60 fights, while Bradley’s record improved to 29 wins (12 wins by KO), 0 loss, 0 draws and 1 no contests for a total of 30 fights. A rematch in November is expected.